Corgis may not be the most popular breed of dogs in the world, but they certainly have one of the most powerful supporters in the world, Queen Elizabeth II. She received Susan, her first corgi, as a gift for her Queen Elizabeth and one of her corgis in an unguarded moment. (You Tube Image)18th birthday. Susan led to additional generations of royal dogs and ultimately to the creation a hybrid dog called a dorgi. Her Majesty's love of corgis began when she was a small child and got to know the dogs owned by the children of the Marquess of Bath. This was followed by her father bringing home a corgi for the family in 1933. 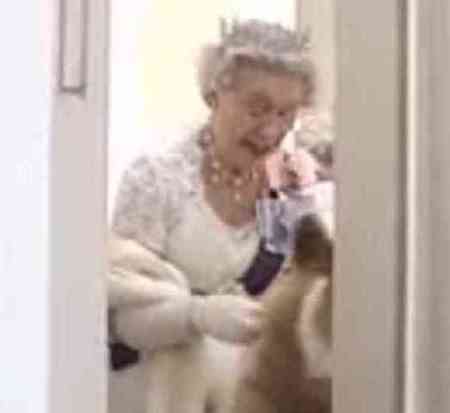 In addition to corgis, the Queen also has dorgis and cocker spaniels. The dogs often travel with her. Even Susan accompanied her and Prince Phillip on their honeymoon in 1947. Dorgis are a mix between dachshunds and corgis. The dogs live a truly royal life. In Buckingham Palace they reside in the Corgi Room and sleep in elevated baskets. Their meals of fresh rabbit and beef are prepared by a gourmet chef. At Christmas Her Majesty makes up little stockings for each of the dogs and fills them with toys and tasty treats. Last year, for the opening ceremony of the Olympic Games in London, the corgis appeared with the Queen and Daniel Craig as James Bond in the film footage of Bond escorting Her Majesty into the games. Monty, one of the corgis that appeared, passed away shortly thereafter in September. One of the dorgis also passed away last year. The Queen was once bitten by one of the dogs and required stitches after she tried to break up a fight between about ten of her dogs. In 2002, for the Queen's Golden Jubilee, a commemorative crown coin was issued showing Her Majesty with a corgi.